The great frustration in watching the U.S. Coast Guard spend $20 million to clean up a mess on the Columbia River was in knowing somebody somewhere was responsible. The indictment last week of an Ellensburg, Wash., scrap dealer for his connection to the abandoned vessel Davy Crockett thus bears full attention not only for its legal outcome but the signal it sends up and down the river that reckless pollution won't do. We have no way of knowing the guilt or innocence of Bret A. Simpson, who saw value in the 430-foot ship's rusted hull plates and parts. What we do know is the Davy Crockett went unregulated when it was moored in water off Camas, Wash., and above land managed by that state's Department of Natural Resources. 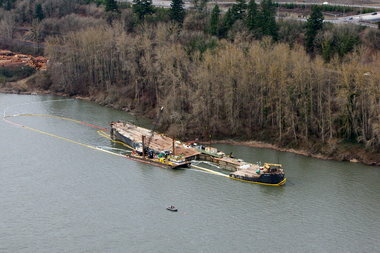 The former World War II vessel needed to crack and become a leaking mess to win wider attention, which it did after sending onboard oil into the river and a sheen 14 miles westward, past Vancouver. Throughout, the federal indictment charges, Simpson either failed to notify authorities or misled them about onboard pollutants before finally abandoning the Davy Crockett and making it a gift to taxpayers. Despite filing for bankruptcy in 2008, Simpson is believed by regulators also to have had a scrapping interest in a derelict barge now parked downstream of The Dalles Dam, The Oregonian's Scott Learn reports. We'd say enough already were it not for the action of a federal grand jury that, under the sweeping Clean Water Act, slapped two felony pollution charges on the skipper. It is unlikely taxpayers will see much reimbursement, whatever the outcome. But all who would use our prized Columbia River for gain will finally know that sullying it is not an option. To do so is criminal.